Glacial turquoise waters, picture perfect towns, and jagged mountain peaks: yes, we’ve arrived in Banff National Park. Skiing Banff has topped our to-do list for a while now, and we finally got the chance. 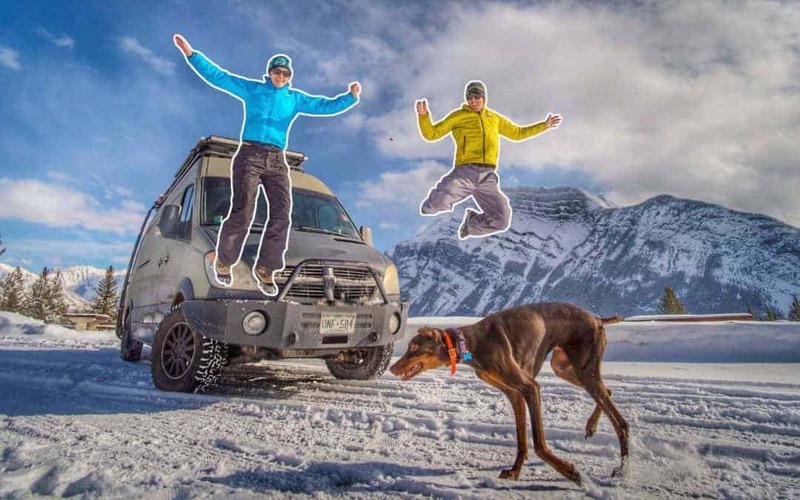 This stop on our winter vanlife tour was to ski Banff Sunshine Village. 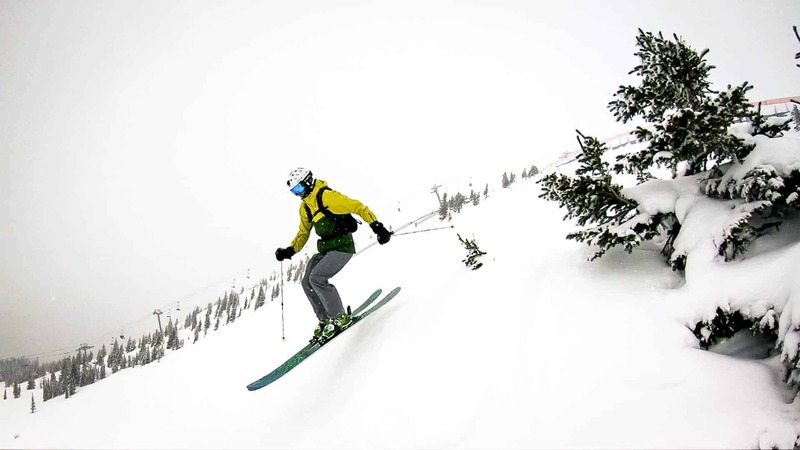 You may have thought that Banff Resort was the ski hill in the park – we did previously as well. On the contrary, there is no Banff Resort. Instead, there is a conglomeration of resorts in Banff National Park: Sunshine Village, Mount Norquay, and Lake Louise, collectively known as Ski Big3. 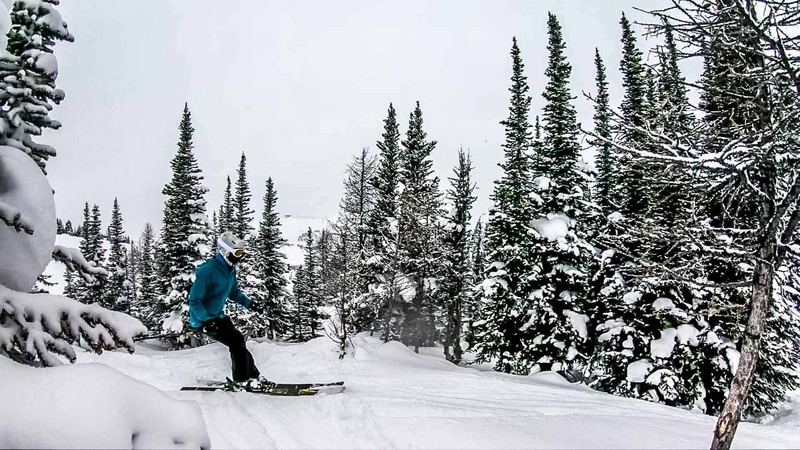 For this week, we skied Sunshine Village and explored the town of Banff. The drive into the park is awe-inspiring, no doubt. Surrounded by jagged peaks soaring above, the mountainous landscape was pristine with a new blanket of snow. Every other curve was marked “avalanche zone” and we could see why. Slabs of snow, who knows how deep, hung precariously off the sides of these Canadian Rockies. Admiring the vast landscape, we continued onto our campsite at Tunnel Mountain. Tunnel Mountain II is the only campground in the town of Banff that is open in the winter. The campground is reasonably priced at about $30 CAD per night and has electricity, showers, and bathrooms open. There is water and a dump station at the front of the campground as well. The bus stop into Banff is just steps away from the campsites and costs $2 to go into town. Although we never took advantage of that, we appreciated it being right there just in case. Aside from logistics, the Tunnel Mountain campground at Banff was incredibly picturesque. Surrounded by those rugged Canadian Rockies, there is no bad view in the campground. We stayed here for 6 nights and truly had to pry ourselves from the area. 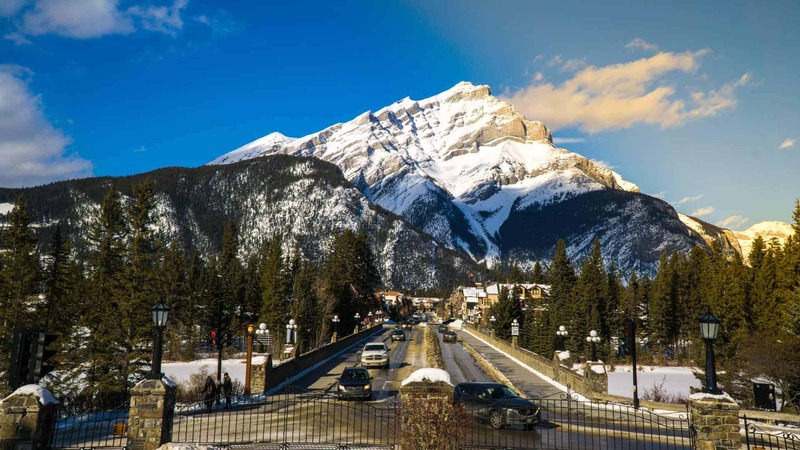 The town of Banff is a picture perfect little mountain town, with plenty of shopping, food, and drinks to choose from. The town is quaint and compact, making it wonderfully walkable, too. We took a day to explore the town as well as a few nights of shopping, eating and drinking. Our favorite thing about the town? 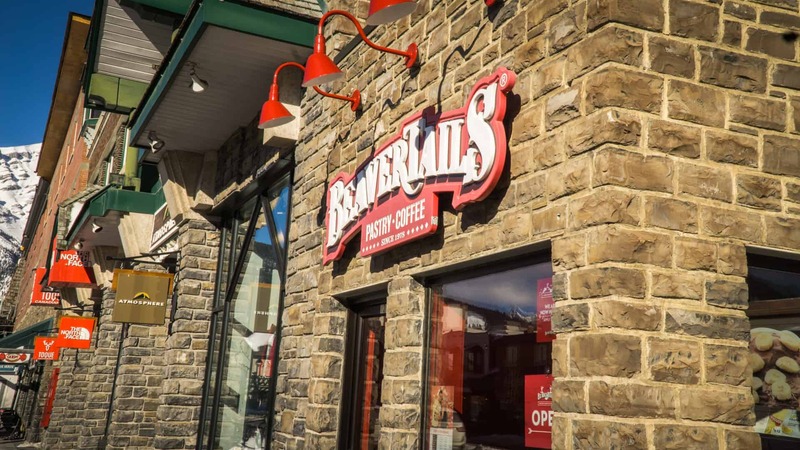 Beaver Tails. Maybe I should say that’s one of our favorite things about Canada as a whole, since they aren’t limited to just the town of Banff. But there is nothing like a hot pastry covered in cinnamon and sugar with a squeeze of lime to warm up after a day on the slopes. Of course, onto the skiing! We had heard amazing things about Banff Sunshine Village and we had pretty high expectations. I can honestly say, it certainly lived up to the hype. Sunshine Village is laid out much different than any ski hill we’ve skied before. After parking just steps from the base of the Village, we hopped onto the gondola to head up. Things immediately were different than what we’ve experienced before. Riding the gondola to the “top” truly puts you at the base of the ski hill. The base of Sunshine Village is more the base of the mountain. So rather than driving to the base of the ski hill, you take the gondola up. The logistics of this layout make it perfect to get skiers and snowboarders spread out throughout the mountain. You can disembark the gondola at Goat’s Eye, which is about mid-station, or continue up the gondola to the base of The Village. 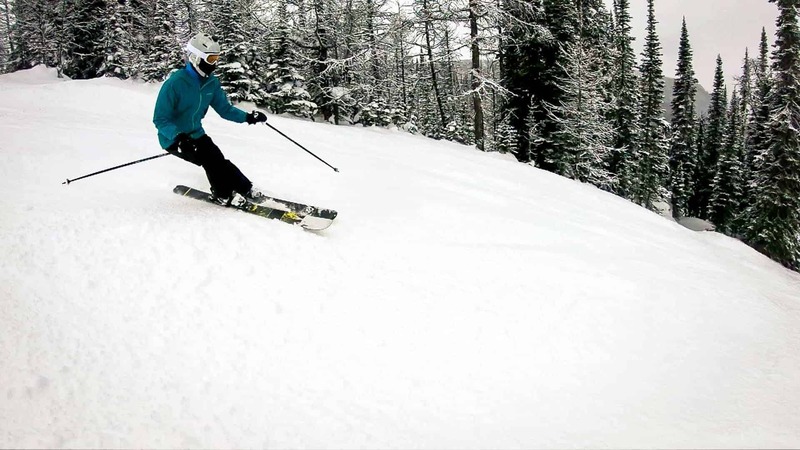 At The Village, you have your choice of Mount Standish or Lookout Mountain to ski. 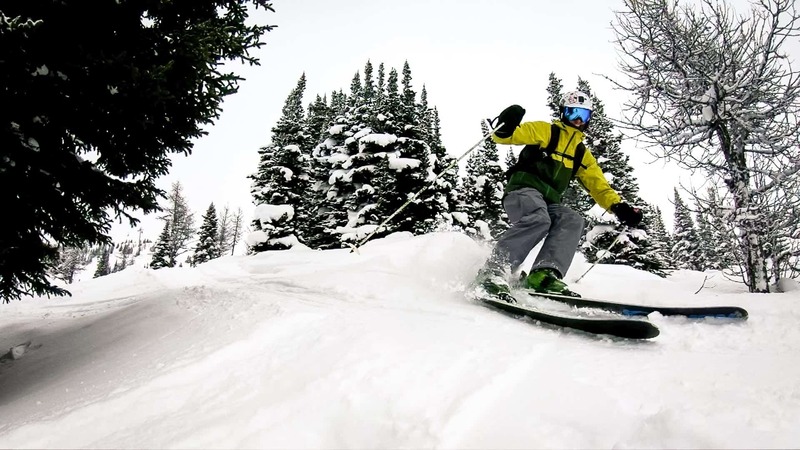 Banff Sunshine Village is made up of three mountains: Goat’s Eye, Mount Standish, and Lookout Mountain. 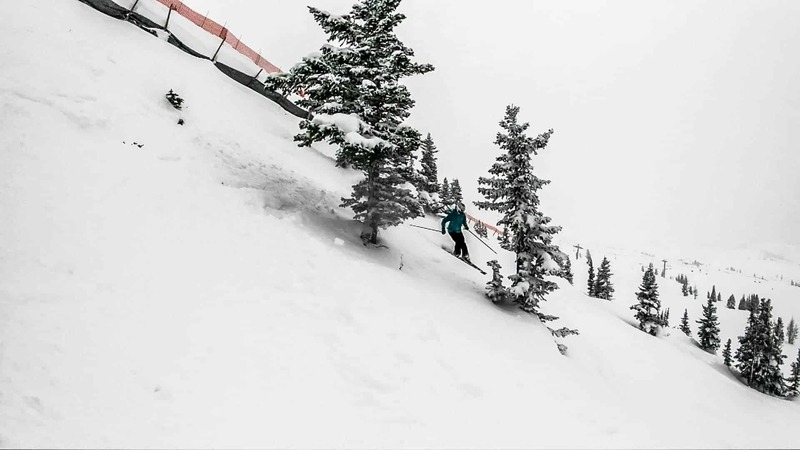 With this much terrain and a widespread feel, the resort never felt crowded in the slightest – even on weekends. While we did get to ski on each mountain a bit, we couldn’t cover all of the terrain Sunshine has to offer in just a couple days. However, we did ski enough to come up with a few favorites from these mountains! 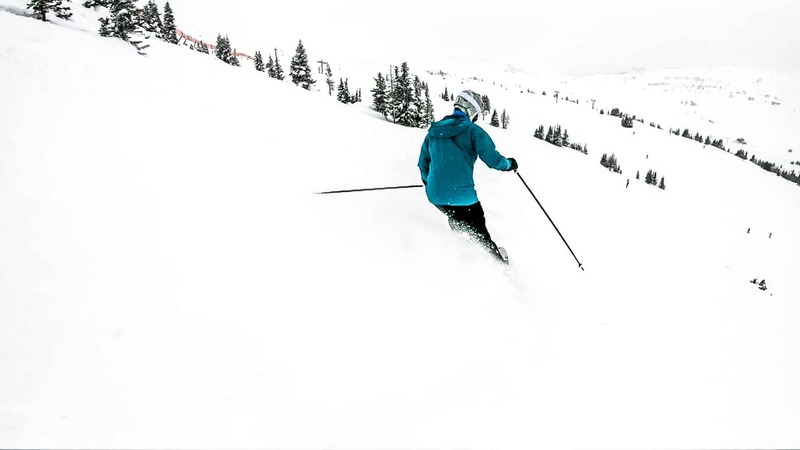 If you’ve followed our blog for a while, you might know our obsession with The Orange Bubble: and Sunshine Village has one! Tee Pee Town, which was (apparently) previously a cold and slow lift that was loathed by many is now a nice warm, shielded, heated-seat, high-speed bubble lift. And we loved it. Not just because of the lift to get to them (I promise), we really enjoyed a few runs off of Tee Pee Town on Lookout Mountain. OS Pitch (advanced/black diamond run) was steep and deep with little to no other skiers coming down. Even after a couple days with no new snow, there was untouched powder here. Coming off of OS Pitch, the World Cup Downhill (intermediate) run had plenty of tree patches to play in while still remaining fast on the groomed sections. Over on Goat’s Eye, we absolutely could not get enough. awesome rolling canyon off the side of Eagle Creek (advanced). The canyon, which you can watch in the video above at 4:36, is fun and relaxed, winding its way through some of the beautiful scenery. Side jumps and banked turns make this canyon a ton of fun. Overall, we really enjoyed the Goat’s Eye Mountain at Sunshine Village. With a variety of terrain and so much to explore, it became a fast favorite. Sunshine Village is definitely a spot we will come back to in the future.